Andreaki, Maria - Photo - at Port of Pireas with family prior to departure for Melbourne Australia on ship Flaminia in June 1959. Photo - Christmas celebration 1959 at Melbourne Commonwealth Government clothing factory. 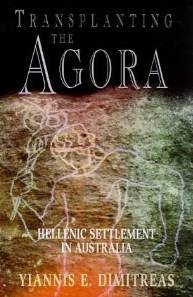 “Transplanting the Agora explores the Greek experience in Australia. Starting with the first Greek migrants who arrived in the mid-nineteenth century, it outlines the reasons for migration, with particular emphasis on the peak period of Greek migration after World War II. It analyses the role of Australian immigration policies, and public attitudes towards Hellenes on their arrival. Yiannis Dimitreas acknowledges the difficulties faced by migrants in establishing themselves in a new country and the effects of discrimination, showing how some groups have fared better than others. He explores Greek participation in the political movements which became the driving force of Australian multiculturalism, and the Greek contribution to the broader Australian community.